Till we reach the actual place, we did not know about the place, where we were going for an outbound trip. The message of outbound trip came to us about 20 days before we are going to join SIIB. 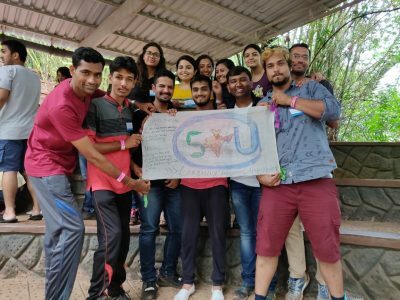 Even during first two – three days of college that is during Induction time, everyone was discussing about Outbound trip. Seniors told us about this outbound trip was Just go and enjoy yourself. Everyone was so excited about Outbound trip hence prepared a day before outbound. Finally, on the 9th june we left SIC campus around 6.30 AM and reached to Surya Shibir around 9 AM, a place near Panshet dam just about 50km away from our hostel location. Surya – An eco friendly resort nestled in Sahyadri valley. There we received a warm welcome at the entry gate of that special place. A special place because those who welcome us were former defense people, completed their service and joined this place in recent past. We were around 250 student. But the arrangement was very good for everyone. After heavy breakfast of Pohe and Idli, we started to explore the place – Surya Shibir. Initially, we all students divided in 8 groups of 30-32 in each group. The first four groups sent for a place for trekking. It was not such a great place for trek, but for those who are beginners for trekking, its good place to start with. I think they have developed this place in last few years. And the other group sent for adventurous activities and games. Luckily, I was in a group of trek. We went to the top of the place within one hour, spent time well by eating Jamun and the other sweet fruit, what we called in Marathi – Karawand. Everyone was) interacting with each other. While returning from top, sir sent us with a “buddy” a partner within us who can provide support. After returning to the place, we had heavy lunch and took a rest for half an hour. The second session of Day 1 started with a game called Ice Breaker, in which a group of 3-4 were letting know about everyone in their group and preparing caricature. And presented the same information to all groups. After 2 hours or so, when this game was over, they given us time for preparing a chill out session in which all 8 groups have to give a performance. Every group has prepared within an hour, and then it was a performance time. One of the groups presented a song and played Guitar. 2-3 groups danced well. Our group performed a skit what happened with us within first week at SIIB, in hostel and in college as well. It was enjoyable performance to and by everyone with just a preparation of an hour or so. After that we had taken a dinner. And then advised us to take a rest. But, we group of 10 members played a game Truth and Dare till 11.30 PM. Thereafter we joined a concert by our friend Alhad and Guitarist Rachit. We enjoyed singing songs with a sweet music of Guitar till 1 AM. The first day for me was like Just never ending, actively participated everywhere. Then went for a sleep, took a rest for just 3 hours. And we were ready for day 2. The second day started with rain, after slight drizzle of rain, we went for sports games. Our group topped in all those games. After that, we were taken to a Strategic game in which Target was to take a dummy from one end to other by overcoming obstacles in the path. Now its time for adventurous games, Rappeling Valley crossing, Zip line, Burma bridge etc. It was a fantastic experience for me, who like to spent time for such activities. I enjoyed every bit of it. After having) lunch, we gathered in assembly hall for a last session in which we were allotted for a task of Poster presentation in which topic is creating a poster of SIU with features. We as a team, gave us a best possible effort and fortunately got the Best price in this event as well. Now it was time to leave the place with lots of memories. We were delighted with ambience, courteous outstanding service by Surya team for almost 250 students. Excellent management by Surya team to facilitate each of us. Even while we returning back to our hostel, we all in our travels bus enjoyed a hectic journey because of traffic by playing Antakshari and Dum-sheraj. Those all were fleeting moments, I will never forget in my entire life.